Roman warriors were known to be some of the best trained well disciplined warriors in history. 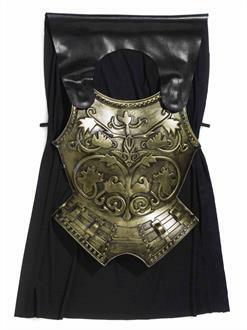 Courageous fighters, well prepared, and looking intimidating, now is your turn to become one for Halloween with this Roman Chest Plate with Cape. Slay the competition and proclaim victory over them as a power Roman soldier! Upgrade the costume with an appropriate weapon prop and look that much more believable.